Contact Jackie for information or other Face – Body – Mind Analysis Training. Body Analysis is the amazing art and science of reading the language of the body. Body language is a universal method of communication. Everyday our body is communicating thousands of messages, speaking to us through it’s shape, form, size and actions. In body analysis we read the language of the body and observe what the body is saying. This knowledge and awareness of the body, can help deepen your understanding of yourself and others. 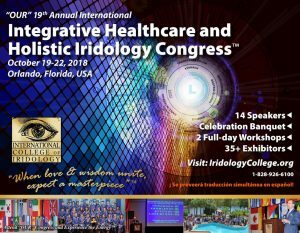 International Integrative Healthcare and Holistic Iridology Congress. Check out this Youtube Holistic Iridology Congress Link: https://youtu.be/3DQPTwu__P8. Our bodies speak without words. They are like walking billboards, communicating our thoughts, feelings and living history. Our face is a map, reflecting our true nature and the essence of who we are. Discover how to read the face like a book. Learn the fundamentals of face reading and understand the multidimensional meanings of your face and its features. Face reading is a powerful and practical therapeutic tool that can expand and catapult your understanding of yourself and others on many levels. It’s a valuable assessment tool easily integrated with iridology. The human body is intelligently designed, providing many ways to read its messages and information. The face is a hologram. It is a map of our whole body just like the iris map of the eyes. It reflects who we are. By observing the shape and features of a person’s face you can understand their physical, mental and emotional states of health. Discover how to see; the organs of the body on the face; constitutional strengths and sensitivities; levels of health; potential predispositions and much more. Face reading is simple, yet profoundly insightful. It is easily used in conjunction with Iridology. The markings and signs are seen in the face and confirm the messages seen in the eyes. Integrating face reading and iridology will leave you with a deeper understanding of yourself and others. Canadian, Jackie Latimer, has been in the holistic health field for over 35 years as a Registered Massage Therapist, Certified Colon Hydrotherapist, IIPA Iridologist & Instructor and Face-Body-Mind Analysist and Instructor. Jackie has lectured nationally and internationally. She presents information in a practical manner that can be put to immediate use. Jackie is fascinated with the wisdom of the human body and its many holographic maps and messages. She enjoys the journey of self-discovery and awareness and loves to teach how to read the meaning of the language of your body. She will share powerful presentations and techniques that help you understand yourself and others on a deeper level by observing the shape of your face and your physical form. IIPA Iridology Certification Courses, Healthy Digestion and Elimination. Disclaimer – The information and material published on cellularhealthinc.com is for general information and educational purposes only. The content on this website is not intended to be a substitute for medical advice. Consult your doctor or healthcare specialist for your specific health concerns. Cellular Health Inc. its owners, directors, or representatives are not liable for any loss or damage what so ever, related to information or services in connection with Cellular Health Inc. or its website. Copyright © 2019 CHI Word Press All Rights Reserved.